Working farmland for many generations, Hemeon’s Head is now an important addition to coastal conservation lands in the MDS. In 2013, the Nova Scotia Nature Trust (NSNT) and Acadia University signed a conservation easement protecting Acadia’s Black Point Beach property and at the same time, NSNT acquired adjacent land extending to Matthew’s Lake. These two properties now comprise the 320-acre Hemeon’s Head Conservation Lands, and are included in the Port Joli Sector of the South Shore Important Bird Area. A wonderful vantage point for watching storm waves, photographers, walkers, clammers, berry pickers and birders enjoy the extraordinary and wild landscape of this beautiful property. Critical habitat for endangered Piping Plover, the sand and cobble beach extends from the headland looking toward Ram Island to the channel opening into Matthews Lake, where extensive mudflats provide important feeding habitat for migrating shorebirds, including endangered Red Knot. 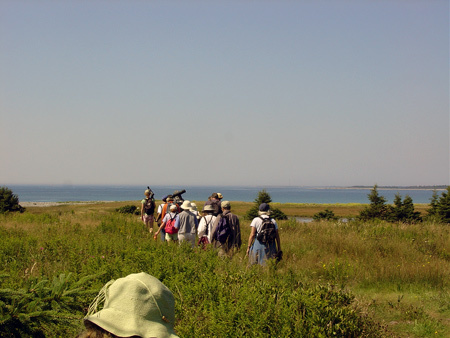 Hemeon’s Head’s bogs, barrens, and forest provide habitat for a wide variety of plants, birds and other wildlife, and in the summer, Ram Island is home to a thriving seabird colony, including Atlantic Puffin, Black Guillemot, and Razorbill. At one time, as many as 11,000 Canada Geese wintered at Matthews Lake!